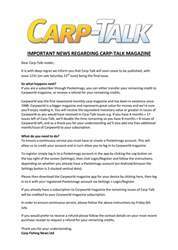 This week’s issue of Carp-Talk (issue 1052) is available to download now. 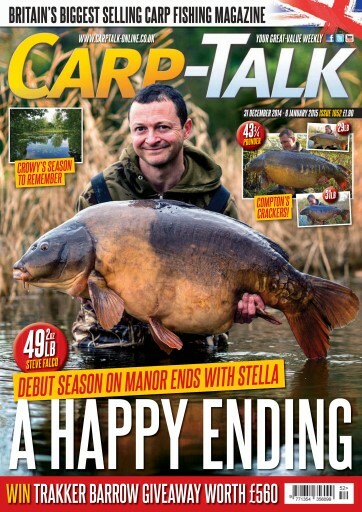 Steve Falco leads the catches this week with his capture of the 49lb 2oz Stella from the Essex Manor. We also have Gareth Compton’s 43¾lb mirror from Rayne Lodge Fisheries, and Dave Smedley’s 41¾lb and 42¾lb from Monks Pit. 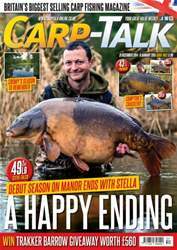 We look back at the highlights of 2014 in our ‘Carp-Talk Timeline’, while Paul Monkman and Ben Wales get more than they bargained for at Gloucestershire holiday venue, Cherry Lakes. Mike Bromfield finds success on Crayfish Pool, and Joe Stephens tries to deal with nuisance fish. 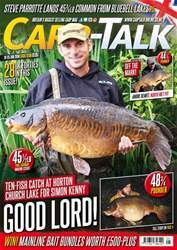 Simon Crow reflects on a terrific year’s carping, and Julian Cundiff is in ‘A-Z’. A few more venues go under the spotlight in ‘Where to Fish’, and Paul Carter speaks to Nashbait guru, Gary Bayes, about the latest products in the company’s range. 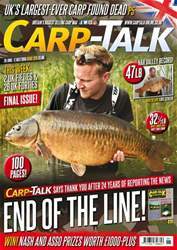 Products from Gardner and Mainline go under review, and items from Avid Carp, CC Moore, Cygnet, Fox, Nutrabaits and Korda are in ‘Trade Talk’. The monthly winners in the Sticky, CC Moore and Gardner competitions are announced, the monthly Wychwood Rising Stars are revealed, and there is £560-plus worth of Trakker Barrows to give away.